Task: Back in 1996, leading Spanish wine producer, Freixenet, had a ‘crazy idea’ – to automate its production processes, including bottling, storing, palletising and baling, using industrial robots. “Where other robot manufacturers saw only difficulties, FANUC saw opportunities and encouraged us with the project”, says Freixenet’s Pere Gibert Guasch. Solution: Starting with two 410 series FANUC ROBOTS, dubbed “Zipi and Zape” by winery staff, Freixenet now has 36 ROBOTs integrated into the production of the 185 million bottles of wine and cava it produces each year. FANUC maintains the robots annually and provides an in-plant hot-line service for more critical operations. Result: After a relationship that has lasted 18 years, Freixenet views its current fleet and prospects for expansion as proof of the collaborative relationship it has enjoyed with FANUC. FANUC ROBOTs, says Guasch, have “always adapted to our particular needs. In our customer-supplier relationship, we consider the treatment we receive from the FANUC team to be close, attentive and collaborative in helping us find the best solution to our challenges”. Bottling at Freixenet is fully automated with ROBOTs. 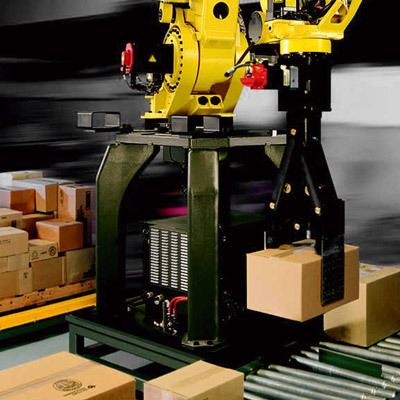 ROBOTs do all the bottle handling, including storage and palletising. “In collaborating with the best brands we strengthen our leading position in innovation and in the quality of our facilities …” says Freixenet’s Pere Gibert. Since a century ago in 1914, when sparkling wines were marketed for the first time with the “Freixenet” brand, the company has not stopped growing. This family enterprise of international scope continues to reinvent itself each day, supporting tradition, wine crafts and innovation. Moreover, Freixenet's competitiveness is reinforced by its commitment towards the environment, given the close link that exists between the process of producing its products and the natural environment that they come from. At present, with the efficiency of bottling robots, the Freixenet Group markets 185 million bottles of wine and cava globally each year. More than 80% of production is exported. The group has 18 wineries spread across 7 different countries and its products are present in more than 150 international markets. “In collaborating with the best brands, we strengthen our leading position in innovation and in the quality of our facilities, which contributes to increasing the value of our biggest asset: producing the world's best cava, with maximum food quality and safety, in the most efficient and sustainable form”. Pere Gibert. In what applications of your production process do you use FANUC bottling robots? The bottling robots are used in all the operations of our production process, from when we start to fill the bottle, while the bottles are being stored in the cellars and up to their being palletised in boxes, or when the pallets are baled for shipment to the customers. When did you start using FANUC robots? The first contacts took place in 1996. It all began with the exposition of a desire, a "crazy" idea. Where other brands saw only difficulties, FANUC saw opportunities and it encouraged us with the project. We currently already have 36 robots in production at our main branch and we hope to expand our fleet in the short term. What FANUC services do you hire? Annual maintenance of all the bottling robots and in-plant hot-line service for more critical operations. How do you assess the work and manner of the technical team? FANUC renders us a high-quality service. It possesses a very well-organised team with technicians with a high level of training and knowledge of their product. The problems that arise are resolved efficiently, always with a countermeasure and a tailored approach. What opinion do you have of FANUC, as a company, as a product and in terms of personal treatment? After a relationship that has lasted 18 years, our collaboration has been and is very valuable. The current fleet and our prospects of expansion are proof of this. As a company, we perceive FANUC's solidity, its good organisation and its technological leadership. As a product, in FANUC we have always found a robot that adapted to our particular needs. In our customer-supplier relationship, we consider the treatment we receive from the FANUC team to be close, attentive and collaborative in helping us find the best solution to our challenges. How would you define FANUC in one word?